Just Jane and myself attended the Trannon Moor outing (not really surprising considering the cold conditions), it was as I feared quite cold, around freezing when we packed up at about 11:45, but nevertheless we did record 7 species and 29 moths (see attached file), two of which were good records, a Female Emperor Moth in pristine condition and a Red Sword-grass, which made the session more than worth while. On Sunday evening we had our second moth event of the season at Simon Spencer’s farm near Llanfyllin. It was quite a well attended meeting with nine of us turning out. The evening looked promising with the temperature not falling below 9c but, as darkness drew near, a cool breeze blew across the farm which we knew could put the dampers on things. As the evening went on the situation didn’t improve so we started to pack up shortly after midnight, at which stage we had only recorded five species (all common) and eight moths. As I was packing the last of the kit a moth flew into the outhouse and flew virtually straight into my hand. Mike Haigh grabbed a pot so I left him to identify it while I finished tidying up. A couple of minutes later he came back to me and said “You’ll never believe it! The moth you just caught is a Broom-tip”. This is a nationally scarce B species which is only found in 31-100 10km squares throughout Great Britain. The overall poor evening was more than made up for with the very late appearance of this scarce species. The first two events of the year were held on quite cold evenings, which meant the counts were relatively low, therefore it was with great relief (we didn’t have to spend the evening rubbing our hands together) that this event was being held in almost ideal conditions, mild and dry with the temperature not falling below 15c. The turn out was good with 19 enthusiasts attending and I must say we weren’t let down. Almost immediately the moths started turning up and by the end of the evening we had mustered 34 species of macro moths, the best record was a Brussels Lace which is uncommon in the county and not to forget the ‘wow factor’ of an Elephant Hawk-moth, there were also 12 species of micro moths. Without doubt, the highlight of the evening was a first county record (and the first record in north Wales) of Assara terebrella (photo in the gallery). It is a local species normally found in southern England south of a line from Norfolk to Gloucestershire in areas of mature Norway spruce, the larva feed on the cones causing them to fall to the ground prematurely, it is uncommon throughout it’s range. A great addition to the county list. What with fine weather and refreshments being provided, a good evening was had by all. Nb. We nearly didn’t have a photo of the Assara in the gallery. You wouldn’t believe what happened, I was just about to take the photo of the Assara when it flew off my desk and onto the floor, I grabbed the pot and covered the moth, when I went to put the lid on the pot it nipped through the gap and was out again. Just as I was about to put the pot over the moth for the second time it flew straight through a gap under the skirting board. As you can imagine by this time the air was absolutely toxic with expletives, I was furious, a first for north Wales and I had lost it. I contemplated tearing out the skirting boards but before I did so I got a long piece of thin cane, stuck it in the gap and flicked it out along the section of skirting board and to my amazement and utter relief there was the moth, which has now had its photo taken. I’m sure my wife is very grateful that the floorboards and skirting are still intact. Partly because the Morfa Dyfi event was cancelled due to bad weather and partly because we were still trying to get some current records of the Rosy Marsh Moth for the county, we, that is to say the MMG decided to put an extra event into our programme. This was to be held at the Cors Dyfi Nature reserve in conjunction with Emyr Evans who is the Dyfi Osprey Project Manager with Montgomeryshire Wildlife Trust. We also had a guest Lepidopterist, Colin Plant, the Hertfordshire County Moth Recorder who was helping out with the event. In the early evening the clouds loomed in the sky, so fingers were kept firmly crossed but as it happened it stayed dry until the early hours of the morning with the minimum temperature not falling below 9.4c. 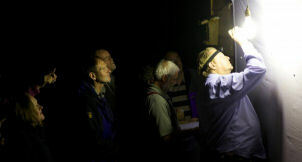 The event was well attended with 28 people and they were treated to a marvellous evening of mothing. The traps were left out all night and the contents were recorded in the morning. Five traps, a white sheet and the local camp-site toilet block gave us seven trapping sites for the logging of species. The white sheet with a UV lamp in front was set up outside the visitor centre and this provided the main attraction for the visitors. The moths started turning up from the moment the traps were turned on. Five new species of micro moth were recorded plus one new species of macro moth. A great session! The only disappointment (if you can say that on such good trap) is that the target species, the Rosy Marsh Moth, still remained unrecorded. When I had turned the traps on I had failed to notice the tissue was still in place. I certainly took a bit of stick about this from Mike and Colin throughout the evening! As we set off for the event the weather seemed set fair, it was dry and calm and the sky was overcast. It looked as though we were in for a good trap, but about 10:00pm the clouds dissipated and the skies cleared. The temperature plummeted to 6c. which generally means that the moths will get thinner on the ground and this is indeed what happened? We set the traps up on the northern side of the lake and were switched on at about 9:00pm. There were only four of us present but we were treated almost immediately to an unfamiliar species of macro moth. I thumbed through the reference book and was soon able to identify it. It was a Haworth’s Minor which I later discovered had not been recorded in the county for over 30 years. An excellent record! As the evening wore on the species count slowly rose with some of the usual suspects until a couple of small, quite dull, Tortrix Sp. were brought in for identification. I was unfamiliar with this species, which turned out to be a moorland species, Acleris caledoniana (new for the county). By the time we called it a night, 16 species had been recorded. So although the species haul wasn’t that great we did manage to add a new micro moth species and confirm that the Haworth’s Minor is still hanging on in the county. The usual running banter added to a thoroughly enjoyable evening. National Moth Night had arrived. For the first time ever the organisers wanted the event to be held over two days, Friday 18th and Saturday 19th September, which would give more people the chance to either trap for themselves or go to an event. This year we were focusing on migrant species rather than individual target species. We had arranged for a public event to be held at the CAT on Saturday evening. The conditions looked good. It was a cloudy evening and the temperature did not fall below 13c. The weather was set fair. We set up base in a small lecture room just off the main courtyard, where I gave a short introductory talk and specimens were brought for identifying and viewing. When the public started to file in it was very soon apparent that the event would be very well attended and indeed it was with 42 turning out. After my brief talk everyone was taken on a bat walk/talk led by Grace Crabb (head of the biology dept. at CAT), unfortunately the resident bats weren’t playing ball at all, so everyone came back for the mothing! A steady stream of moths arrived throughout the evening. One migrant species turned up, the Silver Y and there were some great resident species to see, including the Pink-barred Sallow, Frosted Orange, the stunning Black Rustic, not to mention numerous forms of Common Marbled Carpet giving everyone a very enjoyable evening. This event was to be 3rd time lucky after two previous season’s attempts to trap at Llanymynech Rocks were cancelled due to bad weather. However, although we arrived in good time, it soon became apparent that this was not going to be an easy site to trap on. There were three entrances to the reserve, we tried each of them, but all were impossible. Neither the distance to trek with all the equipment nor steepness of the terrain to battle with, were acceptable. We had been informed by a third party that the venue was accessible for moth trapping, but clearly it wasn’t. The only gate we could have used was locked and the key I had been given did not fit the lock! In future we must check all unknown sites ourselves before adding them to our programme of events. A lesson learnt! Fortunately, Deborah who had turned up for the event kindly suggested we all went back to her place at Welshpool to trap there, this we gratefully accepted, so the evening was not a total waste of time. We set up two traps, one near the house and the other at the bottom of the garden under a canopy of trees. Although it was a fairly mild evening we didn’t have a lot of species or moths but we had a steady flow turning up throughout the evening. Most species were what you might expect this time of year, but the highlight for the evening definitely were the two Barred Sallow that we recorded, nationally not an uncommon species, but very scarce in Montgomeryshire, under 10 have ever been recorded. The three Blair’s Shoulder Knot were also a good record, this species had only been recorded at three different places in the county before. Also, a rather under recorded Pale Mottled Willow made an appearance. So all in all, what with Deborah generously stepping into the breach and copious amounts of cake and flowing tea, plus a few good species recorded, it resulted in a very enjoyable evening.